A grey, cylindrical flying object crashed against a hillside in 1998 before numerous eyewitnesses. Hours later, the entire area was placed under military interdiction. On Wednesday, 7 October 1998, around 16:00 hours, a rather unusual event shattered the customary peace of the placid location of Paihuano. Several local residents – including peasants, schoolteachers, housewives and municipal employees – were witnesses to the impact of silvery unidentified flying object against the slopes of Cerro Las Mollacas. According to their testimony, the object had split in two, with one part remaining near the summit while the other fell a few meters below. “The object was similar to a metallic disk, irradiating an intense metallic glow as it reflected the sunlight. Never in my life had I seen something so strange. Of course, I wasn’t the only witness. Many other people saw it too,” said Raul Flores, a resident whose house was located at the very base of Cerro Las Mollacas. To add to the mysterious nature of the event, radio and television broadcasts faced interference at the moment the collision occurred. Repeaters at Paihuano and Pisco Elqui reported transmission difficulties due to electromagnetic phenomena. Half an hour after the crash, a second event shattered the locals’ placid existence. The entire area was placed under military control. The public relations officer for the municipality of Paihuano, who had planned to discuss the crash incident in a press conference, received a phone call from an alleged NASA official, begging him – in broken Spanish – to cancel the press conference and abstain from providing any information while more data was collected. This background information, as could be expected, was never furnished. In the morning hours of that same day, most residents of Paihuano – disturbed by recent events – found their sleep interrupted by the unmistakable sound of two military helicopters, one of them black in color, like a U.S. Blackhawk chopper – that flew over the area until sunrise. The next day, a taxi cab driver looking for passengers told his compatriots that he’d seen three green trucks driving along an alternate route and dragging a large ramp. On this ramp was a large metallic object with a curved structure, grey in color, with phosphorescent tones, partially covered by a tarp. Nothing more was ever heard about the alleged UFO that crashed Paihuano following this report. 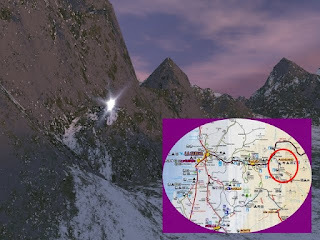 Two days after the collision, a group of neighbors, accompanied by Carabineros (state police) personnel from the local station, made the rough ascent to Cerro Las Mollacas on their own initiative and risk. After six hours of travel, they reached the impact site to behold the remains of the mysterious object with their own eyes, but they found no traces whatsoever beyond soil and many rocks. Many theories to explain the object’s provenance were put forth after the incident. It was said at first that it was a weather balloon, then a lost probe, then a remotely-guided flying vehicle. It was even said that it was a bolide or meteorite from the depths of space, and finally, rumor had it that it was a secret U.S. vehicle sent aloft within the framework of the UNITAS exercises held that same year on the Coquimbo littoral (but which ended on 26 September, eleven days prior to the Paihuano Incident). Today, 14 years later, residents of Paihuano will tell anyone who cares to listen that something very strange fell from the sky that afternoon in October 1998, and that a large cover-up was set in motion to conceal the event. For this reason, many do not hesitate in describing this as the Chilean “Roswell”, alluding to the notorious alleged collision of a manned spacecraft in Roswell, New Mexico, in 1947. There can be no question that an unidentified flying object crashed into Cerro Las Mollacas in 1998, and that hours later, a singular and secretive operation was set in motion to recover its remains (the air traffic controller at La Serena Airport subsequently confirmed the arrival of specialized equipment by air to perform some sort of “downed object recovery” in the Paihuano area). All that’s left to do is figure out what the object was. A meteorite? A secret U.S. vehicle? Or a vehicle from another world? The mystery endures.